Written and designed by outdoor experts, these authoritative guidebooks give long distance and local walkers everything they need to enjoy the Wales Coast Path with confidence. With clear, expertly written and numbered directions, enhanced Ordnance Survey mapping for the whole route, stunning professional photographs, and fascinating interpretation of points along the way, these guides set a new standard in clarity and ease of use. 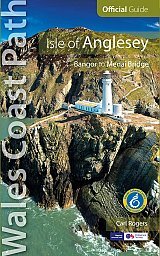 This guide breaks the Isle of Anglesey section of the, Wales Coast Path - from Bangor to the mainland, via a complete circuit of the island, to Menai Bridge - into 12 handy sections.